This entry was posted in News & Views, Quotes and tagged alternate reality, America, complicity, cult, dangerous, fake news, Fox News, frightening, ignorance, media, news, population, reason, stupidity, Trump, trust on June 20, 2018 by Ray Buchanan. 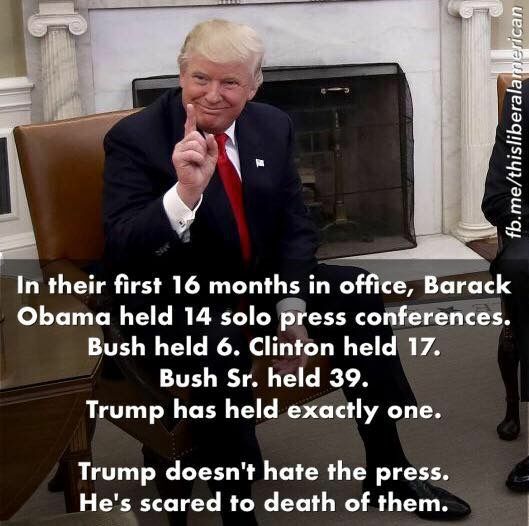 This entry was posted in Facts & Statistics, News & Views and tagged Barack Obama, BLOTUS, Bush Senior, Clinton, fear, George Bush, hate, media, press confeence, reason, scared to death, Trump on May 30, 2018 by Ray Buchanan. Written from a prison cell while awaiting his execution, this short treatise, “On Stupidity,” rings far too clearly despite the passing years. For those with ears to hear, we need to recognize that the political climate within our country is being manipulate by those that appeal to the basest emotions and fears of the least educated among us. Yes, we are living in a dangerous time. Yes, decisions are being made daily that seem senseless on the surface and even evil when more closely examined. But arguing with most of those supporting the present agenda isn’t the answer. 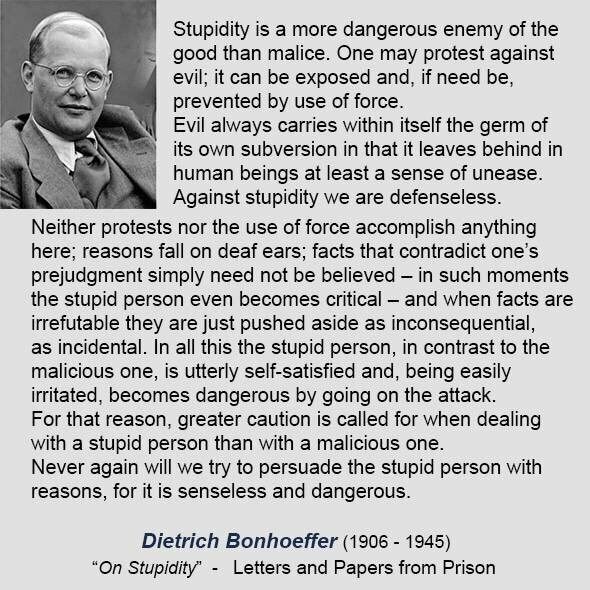 This entry was posted in News & Views, Quotes and tagged belief, caution, criticism, dangerous, defenseless, Dietrich Bonhoeffer, evil, facts, force, good, judgement, Letters and Papers from Prison, malice, persuation, reason, self-satisfaction, subversion, truth on June 1, 2017 by Ray Buchanan.